Acne is not dangerous but may causes a lot of discomfort, itchiness, redness and decreases your facial beauty. Dirty skin, excessive consumption of oily or junk foods, excessive secretions of sebaceous glands, accumulation of excess oil under the skin, attack of certain infectious agents, some hormonal changes and side effects of certain medications are some common causes behind ugly looking acne. Beauty conscious people often spend a lot of money on commercial products but often don't get the desired results. If you are tired of wasting money on expensive products that don't even work and don't want to waste more money then go with natural tips, that are not only less expensive and quite affordable but also destroy acne naturally and quite safely simply by using natural products from around the house. A mixture of Cinnamon and Lemon juice has been shown excellent results in getting rid of acne problem. Make a mixture of one teaspoon cinnamon powder and an equal quantity of lemon juice and gently apply it on your face, especially on the affected areas and leave for 15-20 minutes and then rinse off. For best results repeat this on a daily basis. A mixture of honey and cinnamon powder is also very helpful in curing acne problem. Take three table spoons of pure honey and mix it with one teaspoon of cinnamon powder. Apply it on the pimples and let the paste remain there overnight. Wash it next morning with lukewarm water. Regular application will give you excellent result within few days. To cure acne problem grind some neem leaves and then extract their juice. Now add some turmeric powder to this juice and mix well. Apply this mixture on affected areas at least for 15 minutes and then rinse off. For best results repeat this on daily basis. Fenugreek is also very helpful in curing acne problem. Make the paste of fresh fenugreek leaves and apply it on your face . Let it remain there at least for 15 minutes. Wash the face with lukewarm water. Along with acne and pimples this home remedy will treat your blackheads and wrinkles as well. A mixture of turmeric and rose water is also very effective in treatment of acne problem. Turmeric has antiseptic properties that will fight the bacteria that cause pimples and reduce the production of pimples on the skin. Take some Turmeric powder and mix with few drops of rose water and apply this thick paste on affected areas at least for 15 minutes and then rinse off. Orange peel is also very helpful to naturally cure acne problem. Dry the orange peel and grind this to make orange peel powder. Now add some water to make a thick paste. Apply the paste on the pimples. 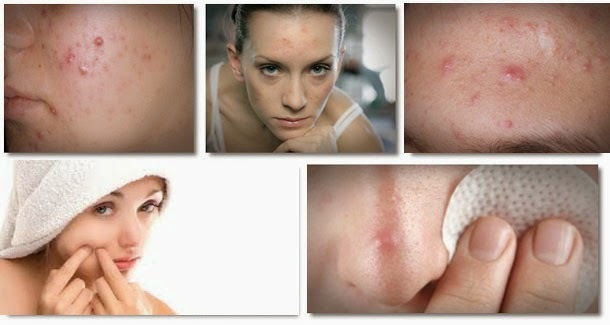 You will have lots of relief in the acne and pimples condition. Garlic is a well known natural home remedy for pimples. Crush garlic and apply fresh juice on and around the pimples. Regular application will solve the problem of acne and acne scars as well. Tomato Pulp is also very effective to cure acne problem. The acidity in tomatoes helps skin dry up acne. Additionally tomato contain vitamins (A,C and K) and lycopene, which can be found in many acne healing medications. To cure acne problem, take fresh tomato slice and simply place it on the affected areas. Alternatively you can mash up the tomato into a pulp consistency and apply like a facial mask and leave at least for 15 minutes and then wash off. Regular application will show you an excellent result within few days. Baking soda is also very helpful to cure acne problem. Mix baking soda with some water to make a thick paste and apply it over the affected areas. Remove it after 20 minutes and wash your face with lukewarm water. Natural bleaching agents of baking soda will definitely help in speeding the healing, clearing up and reducing of the scars. For best results repeat this on a daily basis. (If you are allergic to baking soda then avoid this home remedy). Anti-fungal and antibacterial properties of tea tree oil makes this an excellent agent to treat mild to moderate acne. Additionally it has unique disinfecting and soothing properties and, unlike other acne treatments, tea tree oil will not strip your skin of its natural oils. To cure acne problem you can directly apply tea tree oil on affected areas, leave there at least for 20 minutes and then rinse off. As we know every person has different skin type so if tea tree oil don't work for your acne problem, you can enhance its effect by adding some honey because honey also contains antibacterial properties and promotes skin healing. A mixture of Fuller’s earth(multani mitti), Rose water, and Sandalwood Powder is also considered very effective in getting rid of acne problem. Take 1 tablespoon of fuller's earth, 1 teaspoon of sandalwood powder and enough rose water to make a thick paste. Apply this paste as an anti-acne facial mask and let it on at least for 20 minutes. Finally wash off with fresh water. Plain raw papaya is also very effective acne remedy that removes dead skin cells and excess lipids from the surface of the skin, leaving it soft and smooth. Papaya also contains an enzyme called papain, which reduces inflammation and helps prevent the pus from forming. Mash up the flesh of the papaya well, until it is of a consistency that can be easily applied to your skin. Apply this to the affected areas and leave it on at least for 20 minutes. Finally wash off with lukewarm water and pat dry your skin. A mixture of strawberries and yogurt is also very helpful in treatment of acne problem. The acidic nature of strawberries enables it to remove excess oil in the skin and helps a lot to clear off acne caused by excess accumulation of sebum. The acids penetrate deep into the pores, exfoliating away dead skins cells, getting rid of excess sebum and reducing the appearance of scarring. Take 1 tablespoon of fresh strawberry pulp and mix with 1 tablespoon of fresh yogurt. To enhance the affect you can add 1-2 drops of tea tree oil. Mix all the ingredients and apply this mixture on affected areas at least for 20 minutes and then wash off with lukewarm water. Take 1 teaspoon of rosewater and 1/2 teaspoon of lemon juice and apply to the affected areas at least for 20 minutes. The rosewater will act as a soothing agent and helps repair the skin, while the lemon juice is astringent and drying agent. Both the ingredients helps a lot to cure acne problem. Apple cider vinegar is one of nature's best toners. The malic and lactic acids in apple cider vinegar help draw out impurities and exfoliate the skin. Apple cider vinegar also helps in reducing redness and treating spots before they get out of control. Apple cider vinegar also contains beta-carotene which works well in countering damage caused by free radicals, giving us healthy skin and youthful complexion.